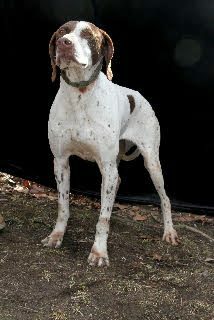 Lulu is a 3-year-old female German shorthaired pointer mix who came to the shelter as a stray. Lulu gets along with other dogs and cats. Sweet Lulu starts off on the shy side until she gets a chance to know you; she would probably do best in a home with older kids. Lulu is a calm and loving girl who likes to go on walks and also loves to play fetch with you. Come meet this wonderful girl. For more information, contact Hi Tor Animal Care Center, 65 Fireman’s Memorial Drive, Pomona, NY (Phone: 845-354-7900, Email: info@hitor.org).